Saraswati Temple Ubud, As you know, the temple is a sacred place of Hindu religion in Bali, and the temple Taman Saraswati Ubud is one of them. This temple, as the name suggests is a place of worship of Goddess Saraswati (Goddess of Knowledge) .Pura that located in Ubud highway is a little different from other temples in Bali. This temple, has a pool that contained a lot of lotus which is main attraction of the temple of Saraswati. If you like ubud style carving, this is the place to look. Almost every building the temple, there is a sculpture of the Ubud artists. It takes approximately 25 minutes to this Saraswati temple from Denpasar Bali with the distance of approximately 18 km. Pura Taman Saraswati Ubud is a Royal temple dedicated to the Hindu Goddess Saraswati honor, the goddess of learning, literature and art. This temple is very beautiful and artistic so many tourists who come to see its charm, other than for the purposes of worship. 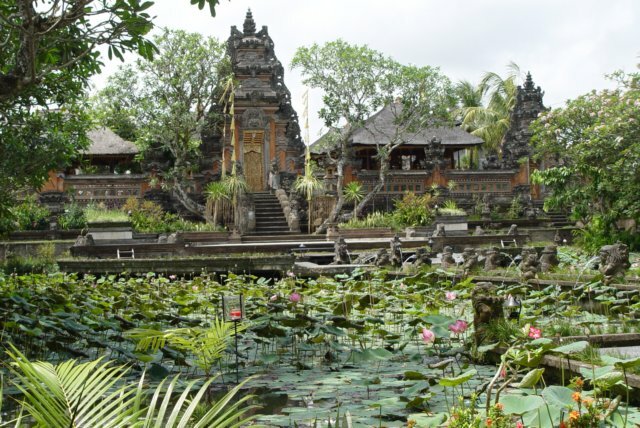 Pura Taman Saraswati has a water park and a lotus pond as the center of its appeal as a tourist attraction. Lotus flowers blooming on pond makes scenery around the temple looks very beautiful and attractive plus there is the courtyard as a place to hold Kecak dance performances and dance performance held every every Thursday night. The temple was decorated with so many fine carvings and included padmasana located in the northeast, there also bale barong, monster masks, sculptures and statues of Goddess Saraswati Satan Jero Dalem fields as high as 3 meters in front of the temple. What’s interesting about this temple is every Tuesday and Thursday in the lurch dance performances, performances starting at 19:30, with a ticket price of IDR 100,000 per person. Kecak dance performances brought by “tari Sandhi Suara”. For those of you who want to watch Kecak dance in Ubud will not be hard, even though you do not come on Tuesday or Thursday. Every day held Kecak dance performances in Ubud, just a staging her different.